You can write an RTI application, without even registering an account in this website. But to keep records of previously filed RTI applications and their details, I suggest you to register an account in this website. Click on ‘Submit Request’ on the top left hand side of the website. After reading the ‘GUIDELINES FOR USE OF RTI ONLINE PORTAL’, tick the check box at the bottom and click on submit. 5. Select the ‘Ministry/Department/Apex body’ under which your public authority falls, and then select your ‘Public Authority’ e.g. For ‘Banking’ select ‘Department of Financial Services’ in ‘Ministry/Department/Apex body’ and ‘Department of Financial Services’ in ‘Public Authority’. For ‘Passport’ select ‘Ministry of External Affairs’ in ‘Ministry/Department/Apex body’ and ‘MEA – Consular, Passport & Visa Division (CPV)’ in ‘Public Authority’, etc. No need to worry if you are not sure of the concerned ‘Ministry/Department/Apex body’ and ‘Public Authority’, your RTI application will be transferred to the concerned ‘Ministry/Department/Apex body’ and ‘Public Authority’ by them shortly, if you chose the wrong one. But it’s mandatory to choose a ‘Ministry/Department/Apex body’ and ‘Public Authority’, so choose whichever you think is responsible for answering. Then fill the details required, like Name, Gender, Address, Educational Status, Phone Number, Mobile Number, Email id, Citizenship. After filling the above given details, choose whether you are Below Poverty Line or not. If the applicant is Below Poverty Line, then he/she need not pay any fee, but has to provide ‘BPL Card No.’, ‘Year of Issue’ and ‘Issuing Authority’. If the applicant is not Below Poverty Line, then he/she has to pay RTI fee of Rs. 10 through SBI Credit/Debit Card or SBI Internet Banking. Type the application in the space provided within the box next to ‘Text for RTI Request application’. Text limit for RTI Request Application is 3000 characters. Only alphabets A-Z a-z number 0-9 and special characters , . 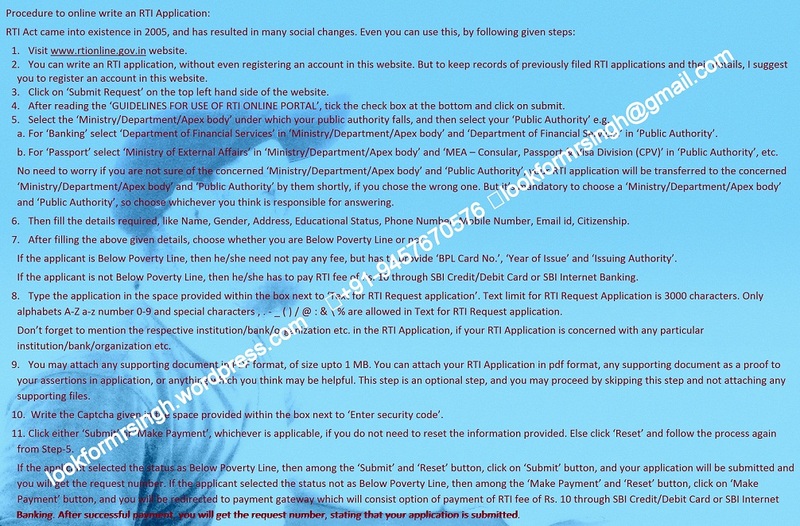 – _ ( ) / @ : & \ % are allowed in Text for RTI Request application. Don’t forget to mention the respective institution/bank/organization etc. in the RTI Application, if your RTI Application is concerned with any particular institution/bank/organization etc. You may attach any supporting document in PDF format, of size upto 1 MB. You can attach your RTI Application in pdf format, any supporting document as a proof to your assertions in application, or anything which you think may be helpful. This step is an optional step, and you may proceed by skipping this step and not attaching any supporting files. Write the Captcha given in the space provided within the box next to ‘Enter security code’. Click either ‘Submit’ or ‘Make Payment’, whichever is applicable, if you do not need to reset the information provided. Else click ‘Reset’ and follow the process again from Step-5. If the applicant selected the status as Below Poverty Line, then among the ‘Submit’ and ‘Reset’ button, click on ‘Submit’ button, and your application will be submitted and you will get the request number. If the applicant selected the status not as Below Poverty Line, then among the ‘Make Payment’ and ‘Reset’ button, click on ‘Make Payment’ button, and you will be redirected to payment gateway which will consist option of payment of RTI fee of Rs. 10 through SBI Credit/Debit Card or SBI Internet Banking. After successful payment, you will get the request number, stating that your application is submitted.